Despite Bethesda’s successful attempt at revitalizing the Wolfenstein series in 2014, I wasn’t sure if the publisher could strike gold twice. After all, DOOM isn’t going to have you drop acid with Jimi Hendrix, and the last time id Software had released a hit was 2004. I’ve never been happier to be wrong, as DOOM is a brilliant reboot that captures what made the series so fun while also modernizing it. What’s interesting is how different both game’s approaches were, and how both were successful despite sharing little similarities. While Wolfenstein: The New Order took time to establish B.J. Blazkowicz as an actual character, DOOM just throws you into the shoes of a newly awakened protagonist who (understandably) seems pretty annoyed that he has to deal with a bunch of demons. There’s definitely a semblance of a story here, but it takes a backseat to the frenetic action that really defines the game. What immediately stuck out after the opening minutes of the campaign was how quickly I could move around the environment. It’s not quite as fast as the 1993 original, but Doomguy could run circles around most first-person shooter protagonists that populate AAA games today. This sense of speed manages to be both refreshing and nostalgic. 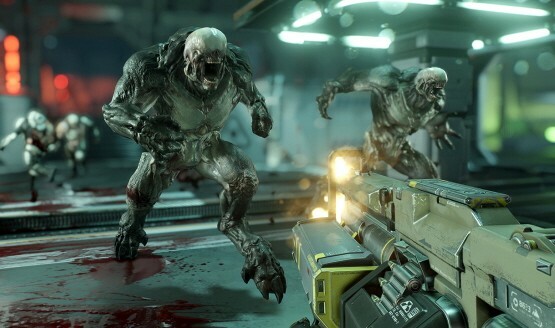 DOOM‘s 13-level campaign is largely comprised of room after room filled with enemy encounters. While that may sound repetitive (and it really is), the core combat loop is so satisfying that I never felt bored. This is largely due to the great brutal kill system that becomes a necessary tool for survival. Once an enemy is inflicted with enough damage, they start to flash and are temporarily staggered. This is the game’s cue to get close and perform a melee attack. It’s not a simple punch, instead it’s an extremely gory scene that will usually leave the demon without an appendage or jaw. Not only does it look cool, players are also rewarded with extra health and ammo for finishing off enemies this way. This adds some new depth to the combat, as I wouldn’t want to use my rocket launcher on group of weak enemies since that would destroy them instead of staggering them. Brutal kills require the player to deliberately choose their attacks, and it was satisfying to pull off from beginning to end (even if the animations got old after awhile). Another way id kept the campaign feeling fresh was by constantly adding new enemies into the mix. These new encounters are amplified by introducing them through a short cutscene. The first time I had to battle a Baron of Hell, a gigantic demon minotaur, it felt imposing enough to be a boss battle. It wasn’t one, and afterwards these enemies became common foes, but it shows how much of a badass the player becomes over time that these huge hulking beasts are just yet another adversary. Even the simplest encounters in DOOM aren’t a cakewalk, so the boss encounters really take it to the next level. There aren’t many of these, but the few that are in the game are very challenging even on the game’s lowest difficulty level. The final boss fight in particular will stay fresh in my mind for quite some time, as I can’t remember the last time I eked out a victory with less than 10 health. Upon completion, it was more a feeling of relief than satisfaction, but I definitely felt like I earned that win. While the campaign is mostly just about running and gunning your way through waves of enemies, there is a nice amount of exploration to be had. Those that check out every corner of stages, and find secret areas, will be rewarded with upgrades that boost your weapons, armor and health. There’s also optional challenge rooms you can find, that will reward you with a special ability if you can clear them. 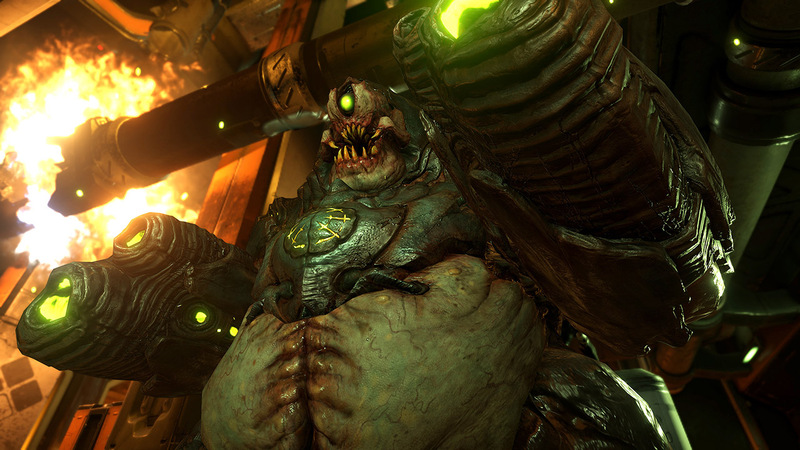 It feels great to be rewarded for exploration, and that’s one of DOOM‘s biggest strengths. What’s not so great is the amount of first-person platforming that has to be done to get from area to area. Perhaps I’m just a stickler to the days when Doomguy couldn’t even look up or down, but forcing players to climb giant towers just isn’t fun nor does it feel like what the series is all about. It doesn’t help that the game’s automatic mantling doesn’t always trigger when you’re trying to grab onto a ledge, so sometimes you’ll look like an idiot just jumping into a wall repeatedly. The first-person maneuvering didn’t often lead to deaths, but the few times it did was beyond frustrating. This isn’t helped by the game’s lengthy load times after deaths, as one mantle that didn’t trigger can mean staring at a loading screen for 30 seconds or more. I thought my platforming nightmare was over once I unlocked an upgrade that gave me a boost jump. It didn’t, as it just led to the game presenting larger gaps for me to boost over. It’s ultimately a small gripe, but it definitely hurt the pacing. The 10-hour campaign is also hurt by some small bugs, and some lack of polish in spots. While the game typically looks great, it’s not uncommon to find some textures in the game that are a lower quality and severely out-of-place. I also ran into audio issues where the game’s metal soundtrack stopped playing, and no voice-over was playing during dialogue sequences. These bugs are disappointing since the core gunplay is so polished. While the campaign may be the main draw, DOOM is a fully featured package that comes with two other separate modes. The one that many gamers have already checked out is the game’s multiplayer, which was the focus of a recent open beta. I didn’t walk away very impressed initially, so it was surprising to find out how much I dug the multiplayer now that the game’s gone gold. What really made me enjoy the team-based multiplayer was how many great mode variants there are. Sure, there are the basics that you’d expect such as deathmatch (including a mode where you confirm your kills, err, I mean harvest souls), but what really stood out was the round based ones. Clan Arena for example, gives players a single life and has two teams of five battling it out until one squad racks up three victories. It’s a blast due to how frantic the action is, and surprisingly nerve wracking since death is permanent. The other mode, Freeze Tag, takes the same concept, but dead players can be revived (or unfrozen) by standing near them long enough. These are both quick modes that I want to keep coming back to. The other mode is a creation tool suite called SnapMap. This is a fitting addition, as the series has always been associated with level creators, and one that allows inspired gamers to create not only new maps for the game, but also new modes (such as wave-based survival). The tools are complex, so don’t expect Super Mario Maker-like accessibility, but I’m already impressed with what I’ve seen the community make. While a lot of levels are just challenging enemy pits, I was delighted when I found a basic music creator. I was able to set up drum loops, and then ring a cowbell until I gave myself a headache (one that is still bothering me as I write this review). The best part is that these user created maps can be played online, so you can have a space marine band if you want. There’s a few disappointing aspect about SnapMap, though. There aren’t great sorting tools in place yet, so you can’t follow a creator like you would on LittleBigPlanet. Hopefully it’ll be patched in later on, but if it becomes hard to find good created content then it’ll fail to catch on. Another bummer is that in multiplayer, you’re limited to holding two weapons at once, which is a far cry from the vast collection of weapons you have access to in single-player.